CW Eye is a procedural material shader tree for Blender. Developed for the Cycles Renderer. Save a lot of time and create countless eye variations just by changing some values in the shader. Starting at "simple" human eyes you can create eyes for aliens, zombies or whatever you imagine. This package already includes five cool eye presets I've prepared for you. Feel free to use them as a starting point for your own variations! Your results can be baked optionally into textures by using Blenders internal bake system. If you are not familiar with Blenders texture baking system, visit my free tutorial link in the documentation tab. Five example presets. Included in the Blender scene. 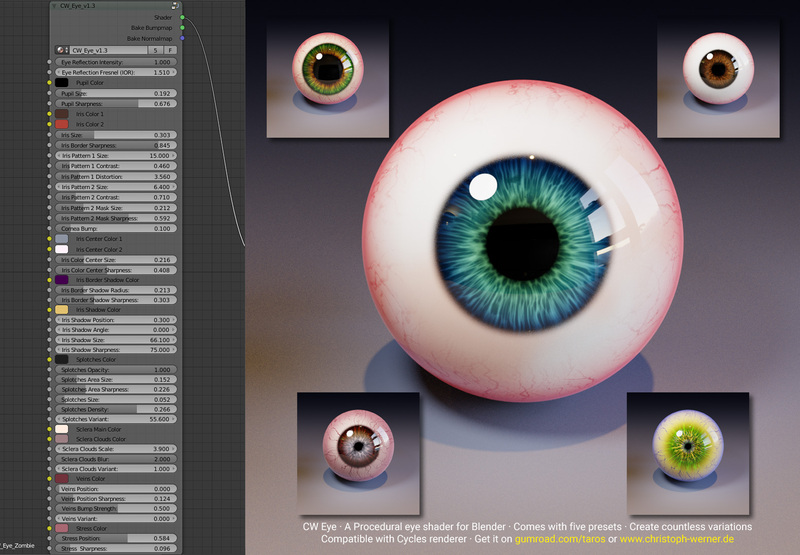 Example renderings of the eye preset. 1. After the download of CW Eye, unzip the ZIP-file to your preferred folder. 3. In the upcoming file browser open your local CW Eye folder and choose the CW Eye .blend file. 4. The .blend file opens and show a scene tree. Click on the Material folder and choose one of the CW Eye presets. For example CW_Eye_Ocean. 5. The CW Eye material is now added into your project and you can assign it to any object via the material tab in the object properties. If you still have problems to install CW Eye, watch the installation video below or contact me please. The following videos describes the material usage and give you some additional infos. The Documentation videos for current versions will be updated regularly. Don't wonder about mentioning my gumroad shop in some videos. You can download CW Eye here on Blendermarket or in my gumroad shop, too. Is it possible to generate regular texture images from this material? Yes, you can bake the procedural results into a texture page. To do this please use blenders internal texture baking system. I have prepared a small tutorial video on the Documentation page for beginners how to bake textures. Do I need textures for using this material? No. The whole material is procedural. No textures needed.